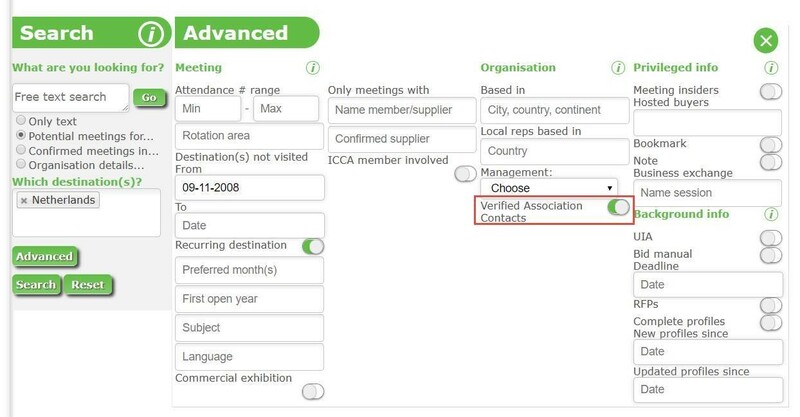 Association engagement: ICCA Verified Association contacts now available in the Association Database! As part of the continued BOD Strategy to engage more with associations, we are delighted to announce that we have made an addition to the live Association Database: all Members can now search on potential meetings, confirmed meetings and organisations which (organisation) has a Verified Association Contact. This is part our wider strategy of encouraging more association engagement within our community, as discussed at our Town Hall meeting during the 57th ICCA Congress in Dubai, which was open to all members. The meeting resulted in an open dialogue about the topic and as a result, the working group will be engaging with a group of volunteers to develop the discussion further. This is an important step to make the ICCA Verified Association Contacts more visible to all ICCA Members, and encourages their involvement in your research and bids for international association meetings. How to find Verified Association Contacts? Should you have any questions about this, please contact your Regional Office.